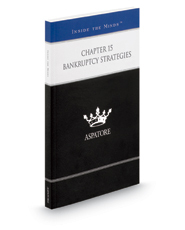 This Aspatore legal title provides an authoritative, insider's perspective on understanding the scope and overall goal of Chapter 15. Partners from law firms across the nation and a judge from the western district of Texas guide the reader through the process of determining when it is appropriate to file a Chapter 15 case and highlight the measures for preparing the required documentation in cross-border insolvency proceedings. These professionals offer advice on identifying the clients' objectives, achieving recognition, and expediting the filing process.